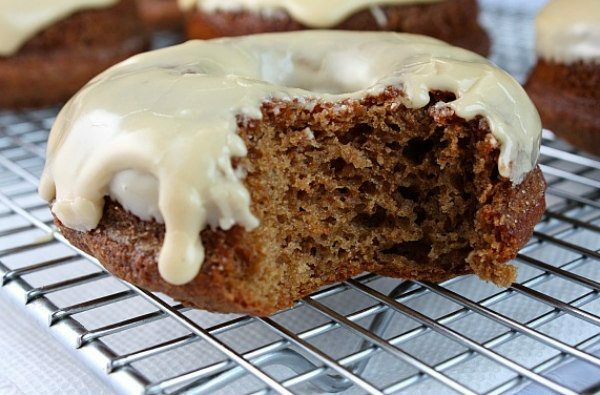 These baked Apple Cider Doughnuts are a great breakfast treat. 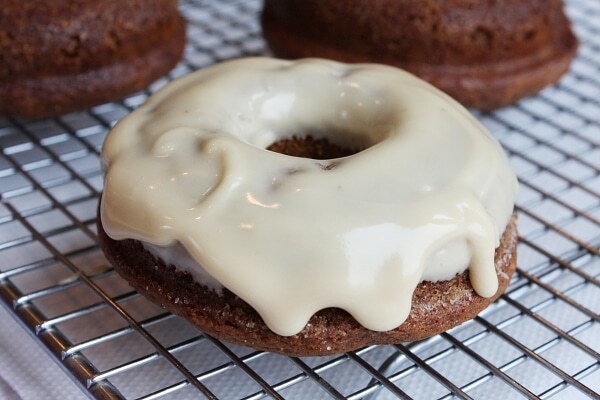 Apple Cider Donuts are dunked in a light cream cheese cinnamon glaze. When I was growing up, Sunday mornings were all about donuts. I remember hopping in the car to accompany my Dad to Winchell’s, where we’d choose a variety of donuts to bring home to the family. Personally, I liked the maple bars, old-fashioned and anything with pink icing or sprinkles. As a girl who is more often than not watching her calories, I don’t visit too many donut shops these days. 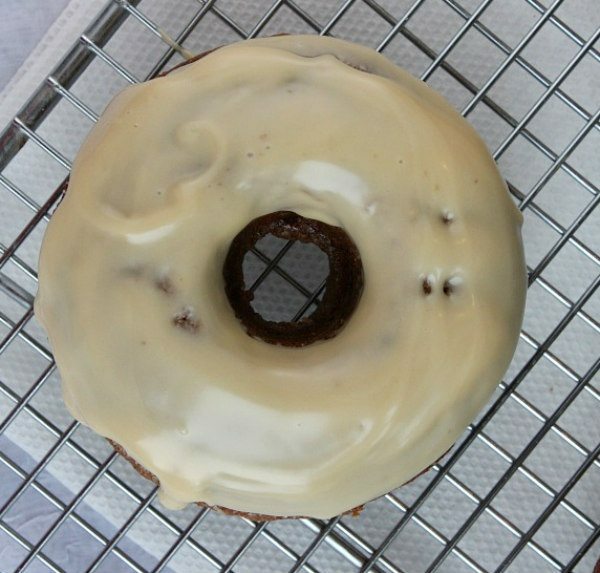 Instead I do things at home, like make these baked Apple Cider Doughnuts. 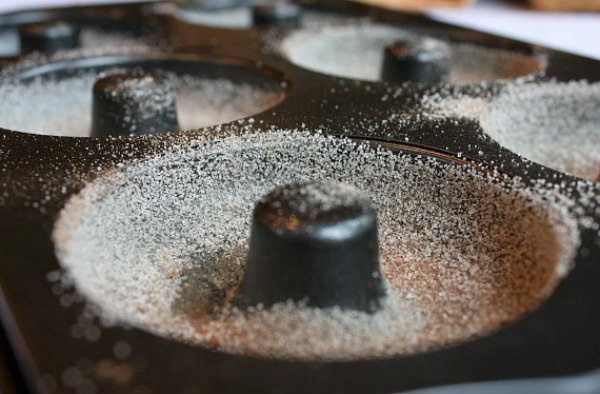 The pans are lined with nonstick spray and a sprinkle of sugar. 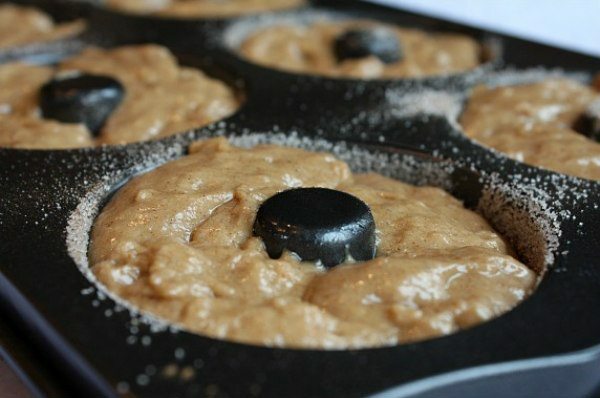 I invested in some donut pans, but something tells me they’d bake up just as well in a mini-muffin pan. I made a few big donuts and lots of little ones. Be careful not to fill the batter to the tops of your donut pans or you’ll lose the hole-in-the-middle when they puff up while baking ? Uh, yeah… that happened to some of mine. They’re pretty good on their own without any adornments. 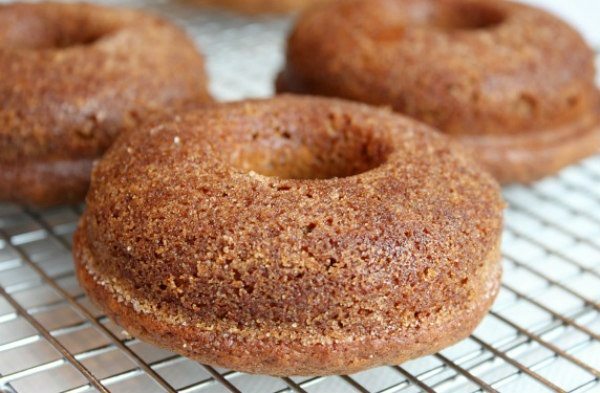 Apple Cider Doughnuts are even better dunked into glaze. 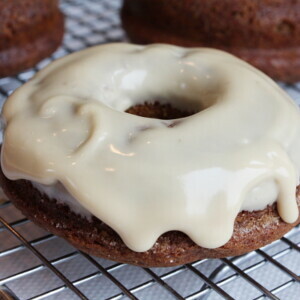 This glaze is a simple mix of powdered sugar, light cream cheese, cinnamon and milk. Place them on a rack to let the icing set. They’re ready to eat when you are. The texture of these is a bit different than regular, full-fat, evil donuts… kind of an airy cake texture. I think they are best eaten the day they are made. My son would disagree and tell you that day-old leftovers are just as good! For the chance to eat a doughnut when you're having to watch your calorie intake, this baked version is quite the treat. 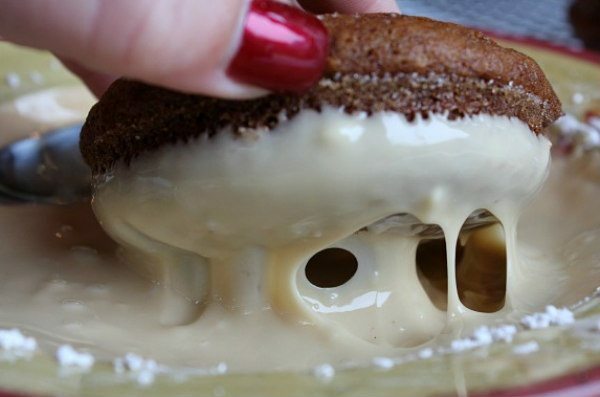 You will need a mini doughnut or bundt baking pan with 12 cavities or a 6 cavity doughnut baking pan for this recipe. Preheat oven to 400°F. Coat pan with nonstick spray or oil. Sprinkle with sugar, shaking out excess. In a mixing bowl, whisk together flour, baking powder, baking soda, salt and cinnamon; set aside. In another bowl, whisk together egg, brown sugar, apple butter, maple syrup, cider, yogurt and oil. Add dry ingredients and stir just until moistened. Divide half of the batter among the cavities in the prepared pan, spoon about 2 generous Tbsp. of batter into each cavity. Don’t fill them to the top or your doughnuts will lose their holes when the batter puffs up while baking! Bake 10 to 12 minutes, or until the tops spring back when touched lightly. Loosen edges and turn the doughnuts out onto a rack to cool. Clean the pan, re-coat it with oil and sugar. Repeat with remaining batter. Glaze your doughnuts, if desired. Sift 1 cup powdered sugar and mix w/ 2 ounces light cream cheese, a dash of cinnamon and enough nonfat milk to create a spreading or dipping consistency. Dip tops of doughnuts into the icing, then set right side up on a rack to let the icing set.